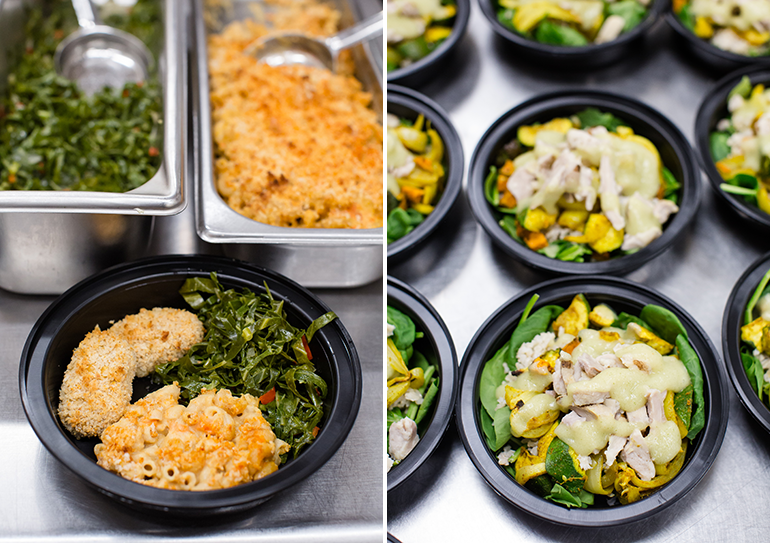 North Carolina school district food managers partner with local chefs to create new recipes—and community connections. 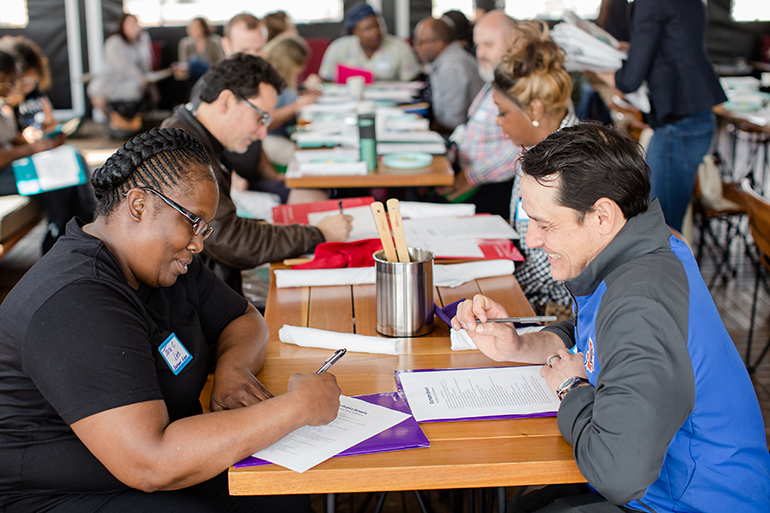 In April, nine kitchen managers from Durham Public Schools in North Carolina and 10 local chefs gathered at a downtown hotel to kick off Durham Bowls, a project that pairs school food managers with professional chefs to create new recipes using ingredients and guidelines that comply with school nutrition standards. Once they were paired, FIG gave each team matching bandanas and a list of get-to-know-you questions. Teams spent time talking and then spent time brainstorming recipe ideas. Encouraging connections between people in these separate food worlds was a project goal from the beginning. They want to encourage authentic relationships and inspire new ideas that will help bridge the gap between those creating food for students who live in the community and the restaurant players in the town dubbed “America’s Foodiest Small Town” by multiple media brands. Hopping notes that many local chefs have a community-oriented perspective and want to be involved in school food, but don’t know how to navigate the school system. At the same time, school food managers want to incorporate local ingredients and play a part in the community food system but don’t have the training or systems in place to make it a reality as often as they’d like. Durham Bowls helps them meet in the middle. Each team is tasked with creating one recipe that meets two criteria: it must be served in a bowl and it must use at least one local ingredient. All ingredients are available as commodities or through local distributors that already supply local foods to the district. After the kickoff event, each team tested their recipe in the manager’s school kitchen. The project is designed to facilitate a healthy push-pull, with chefs designing for flavor and visuals and managers for elements such as serving size, student preferences and sodium content. Salt, Thayer says, may be a sticking point. But all recipes will comply by October: This summer, FIG will analyze and adjust recipes to fit nutritional standards. One team is serving a stew-like medley in a Sysco-sourced bread bowl with raw pieces of curly kale and Mandarin orange segments on top. In a taste test, students picked up the pieces of kale and “ate them like popcorn.” Another team reduces local broccoli to green bits and blends it into a creamy chicken dish. At the Oct. 13 event, where 300 to 500 people will get to sample the meals, a student panel will judge the bowls and hand out awards. After the competition, the district will serve one bowl to the whole district monthly for the remainder of the school year. FIG is also inviting chefs to offer their team bowls as options at their own restaurants and to donate the difference between the price of the meal and the $3.31 USDA meal reimbursement rate to Durham Public Schools. The organizers say this is the first of what they hope will be an annual event. “We don’t think this is going to fix school food,” Hopping says. They want to provide an avenue to support it and widen the definition of what school food can be. “We hope this can happen in more places other than Durham,” Thayer adds. “We’re hoping this can be an example of a way to engage lots of people” on the issue.